We've all viewed our share of photography through a mirror, but I can almost promise that the entries in this week's Shooting Challenge: Reflection in a Mirror have a few tricks you've never seen before. 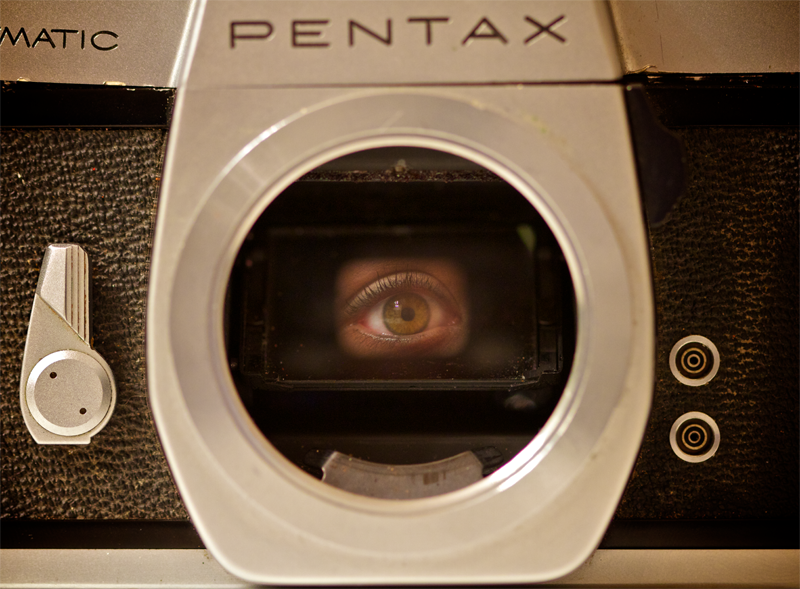 "Picture of the reflection from the internal mirrors through the viewfinder of a Pentex Spotmatic with the focus lens taken out. Took quite a few tools and brute force to get it apart to remove the lens. It really shows how indestructible these old cameras really were." "Subject was captured through the lens of a Canon XTi with a 50mm prime, bouncing off the internal mirror, then through the eyepiece. Got a laugh in that it's a non-SLR camera capturing the subject through a DSLR." Equipment: Nikon D5000, 55-200mm Lens, f5.6, 1/200, Focal Length: 155, No manipulations other than RAW adjustments and Cropping for contest. "Walking around the office looking for reflective surfaces, I came across our table we use for eating. Nothing really caught my eye until I found some marbles in my Boss's office. There are many reflections that caught my eye, including the reflection of the windows/chairs on the table inside the marble, and the reflection of the marble itself. Hope you enjoy." "I took this walking down the street in NYC this past Thursday somewhere near the Chrysler Building (42nd & Lex). It was a beautiful, sunny day out so I dropped the exposure a few stops. Other than that, no special settings were used. That 50mm is pretty forgiving. :]"
Center Weighted Metering. I edited the shots using Photoshop too. "I used 2 mirrors to reflect my dog when he was on the balcony entrance taking in the breeze." I used a Canon XSi with the stock lens (35-55mm) at full zoom and f/5.6 aperture. "It took many shots to get the right angle, but I eventually got it. The picture is not edited at all (other than increased sharpness and contrast)." Nikon D80 with a 18-70mm lens, 60th of a second exposure, lens wide open, ASA 1600, Natural light from windows of the lobby. "Downtown Dallas reflective metal ceiling." D200, 35mm, iso 400, f2.8, Canon 7D, Canon 100mm IS USM f/2.8L taken at f/5.6, aperture priority, 1/40 sec. "All natural light from the window." This week was especially fun (and hard) to judge, as I don't know we've seen such a diverse number of approaches to a common theme ever before. The entire, awesome gallery is below. Also, you can view it all on one page here. Keep a lookout for our next Shooting Challenge, to be announced this Wednesday. In the meantime, call our your faves in the comments. Oh, and we'll be posting wallpapers from this and a few older contests later this week.